This tall, front facing vase arrangement offers height and a splash of colour. 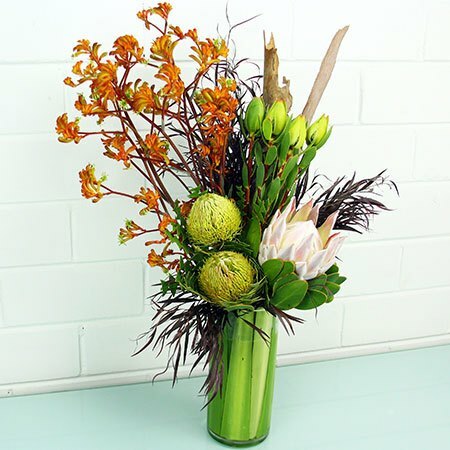 Featuring seasonal, long lasting natives such as banksias, proteas, leucodendron, kangaroo paw, textural grasses and husks grouped in a modern floral style, these office flowers look great on a corner coffee table, against a feature wall or on a reception desk. The basis of this office flower design is a neutral green, white and chocolate colour palette, with a vivid burst of warm orange, yellow or red to add contrast. *Please note: The type of native flowers and foliage will be dependent on what is available from season to season. Colours can be customised based on your office decor. We deliver corporate flower arrangements to any commercial business on a weekly basis throughout the Sydney metro. The prices listed above can be used as a guideline, however we offer a fully personalised corporate flower service catered to your unique requirements and budget. Please call our team on 1800 66 66 46 or email sales@flowersforeveryone.com.au for assistance. 2017-03-30 Service rating : Beautiful arrangements for our client breakfast event. Thank you.